Welcome to A10 Talk’s Top Pre-Season Top 25 Player Countdown for the 2017-18 season. Each day, we’ll be publishing a new article counting down our best 25 players for the coming season. Today, we feature #3 E.C. Matthews, from Rhode Island. The reigning Atlantic 10 Tournament MVP is back for his senior campaign, with many points still left to prove. The entire college basketball world still wants to know if E.C. Matthews is mentally over the brutal ACL tear that he suffered just two seasons ago. After all, Matthews could single-handedly be the reason why the Rhode Island Rams are able to make it into the second weekend of the 2018 NCAA Tournament. While playing 29.3 minutes per game, the Detroit, Michigan native averaged 14.9 PPG and 4.3 RPG last season. 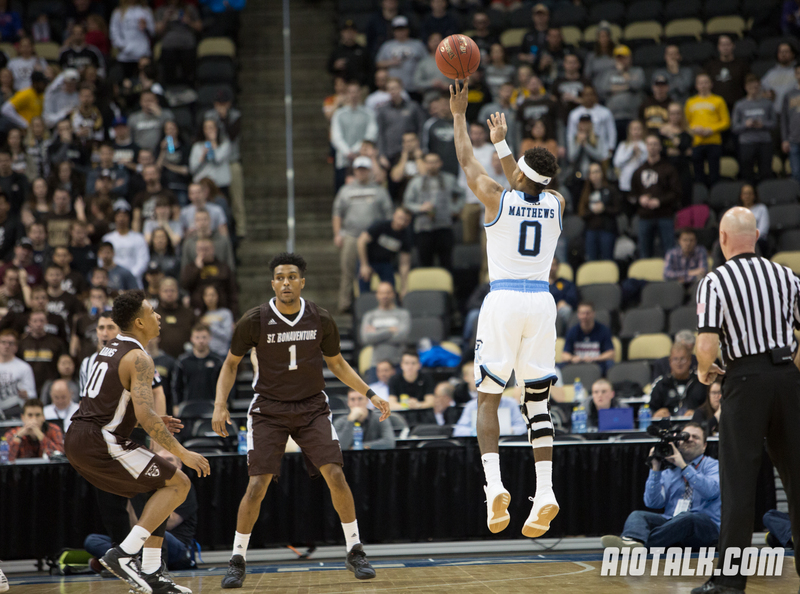 After scoring no less than 19 points in each of three games that URI played in the 2017 Atlantic 10 Tournament, Matthews will look to shoulder the load again for a loaded backcourt. Throughout the regular season, Matthews had a terrible habit of disappearing when it mattered late in games. However, his ACL seemed just fine when he powered down a dunk in the Ryan Center versus Davidson during Rhode Island’s senior night. As all Rhode Island MBB fans should, everyone will be keying in on how Matthews will perform when the game is on the line, time and time again. There is no time like the present for E.C. Matthews to make a final run towards being a NBA draft pick in 2018. After all, being a Preseason First Team All-Conference selection is nice but winning the conference player of the year award means a whole lot more. If Matthews wants to get to where he wants to be in professional basketball, he will have to earn the ball over the likes of Jared Terrell. With arguably the most talent around him ever in Kingston, RI, Matthews will lead the clear-cut favorites in the Atlantic 10 into battle every night. E.C. Matthews should be expected to pace the Rhode Island men’s basketball team every night in the scoring department. Follow us on Twitter, like us on Facebook, and check out our forum for more Rhode Island content. Andrew Phung is a dedicated sports fan and he writes about all sports. As a college basketball fan, his passion is avid and relentless. In the college basketball world, Phung is a fan of the Rhode Island Rams and a few other teams (outside of the Atlantic 10). His tremendous knowledge on college basketball comes from all of the games he watched throughout his childhood up to the current day. In addition, Andrew Phung is a contributing writer to Rhody Rampage. Be on the lookout for his future in-depth coverage on the Rhode Island Rams basketball team, as well as the rest of the Atlantic 10.